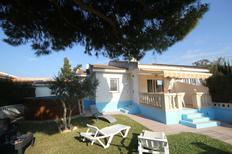 Holiday home for up to eight people in an almost perfect location, south of Tarragona. ​Coast of Catalonia | Regardless of whether it’s the Costa Brava or the Costa Dorada – there are holiday homes on the Catalonian Mediterranean coast which are near the water and offer a direct view of the blue Ocean. ​Holiday villa for up to six people above Calonge. Costa Brava | Give your holiday in Spain that little bit extra. An own pool not only provides the ideal possibility of retreating from a full beach, but also just gives off a great deal of flair. 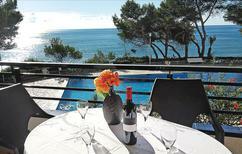 “The Mediterranean Sea surges up to the terrace,” wrote one atraveo customer about this holiday home near Miami Platja. ​Costa Dorada | The “golden coast”, located south of Barcelona, owes its name to the shimmering colour of its beaches. 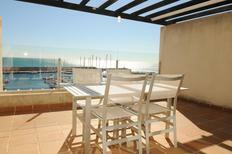 The beach and the sea are only a few metres away from these properties. "Beautiful house" an atraveo customer wrote about this holiday house for 4 people in Catalonia. 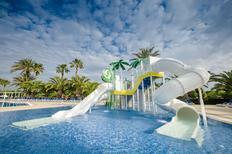 ​​Spain | Great holiday for little money? No problem. Here we offer you a selection of holiday apartments and houses that are both cheap and have been rated very positively by other travellers. A holiday house at the Costa Dorada costs on average GBP 832 in the cheap travel period and GBP 1,556 in the peak season per week. These details are of course in relation to the house and not per person as well as includes the obligatory additional charges. The coasts of the Iberian Peninsula are usually characterised by rocks. 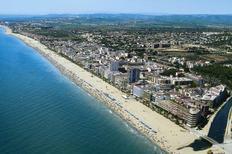 The Costa Dorada is the coastal area with the largest share of sandy beaches in Spain. 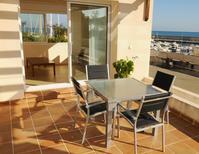 Therefore a multitude of holiday houses at the Costa Dorada can be rented which offer direct beach access. This not only spares you long and tiring drives to the beach and the daily search for parking spaces. You can also take a walk at the still empty beach and even take a first dip into the Mediterranean before breakfast from the convenience of your holiday house at the Costa Dorada. The Costa Dorada stretches along 216 kilometres between Vilanova i la Geltrú and the in the south of the Ebro Delta situated city Alcanar along the northern Mediterranean coast of Spain. Unlike the more northern Costa Brava, the banks along the Costa Dorada are mainly gently sloping and characterised by long, fine sandy beaches. The Costa Dorada owes its name to the yellow grains of sand of its beaches which often sparkle golden in the sunlight. Due to the vast extent of its beaches it is ideal for family holidays with children as it offers enough space and opportunities for playing, frolicking around and abundant bathing fun. If you should choose a holiday house in the south of the Costa Dorada you are not far away from the natural park Ebro Delta. With a total area of 80 square kilometres it offers extensive opportunities for long walks and hikes. The landscape is characterised by small lagoons which offer a habitat for up to 300 bird species. But also the many smaller and larger villages along the Costa Dorada such as Cambrils, Alcanar, Cunit or Calalfell are worth a stroll along their coastal promenades and their small alleys. North of the Costa Dorada lies the Catalonian capital Barcelona. Especially the Barri Gotic, the Gothic quarter of the city centre, is full of architectural sights such as the Cathedral of the Holy Cross and Saint Eulalia or the Plaza Real. Barcelona’s probably most famous street, Las Ramblas, is ideal for strolling around. The wide avenue leads from the centre to the harbour and is usually populated by numerous street artists and hawkers. Barcelona is also renowned for its art nouveau buildings as well as the Sagrada Familia, which is part of the UNESCO’s World Cultural Heritage. South of the Costa Dorada lies the city Tarragona. With just over 130,000 citizens it is considerably smaller than the metropolis Barcelona, but not less worth a longer visit. The city not only offers remnants of Roman architecture with the Pont del Diable, remains of a chariot racing track and the antique amphitheatre, but also a contorted old city with many picturesque alleys which invite you for a stroll and dwell in one of the many small cafes and restaurants. Particularly appealing is also Montblanc which is situated in the interior of the country with its historic city centre. 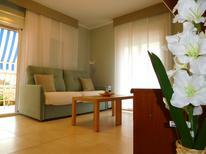 Thus a holiday house at the Costa Dorada combines bathing fun and culture ideally.